Ammazzacaffè (Italian for coffee killer) is a small glass of liqueur usually consumed after coffee to dull its taste. It is a common Italian custom, especially after a generous meal. Ammazzacaffè is the popular Italian assimilation and adaptation of a usage born among aristocratic classes, where it was common to move to a different room to smoke and to serve a cognac or a brandy after dinner. 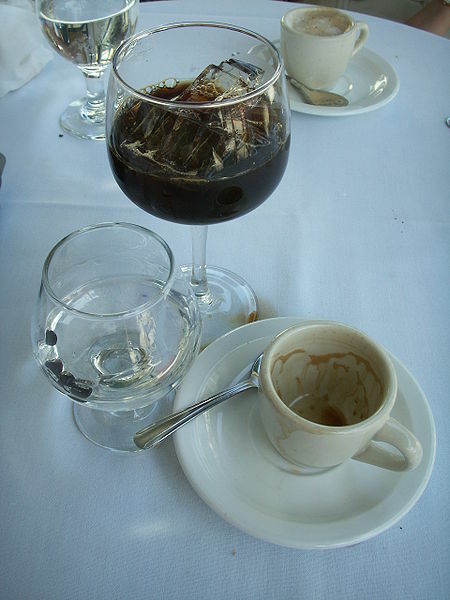 Left: Sambuca, served as an ammazzacaffè. Nowadays it is still a common custom in Italy, even at lunch, and it is made of bitters or a local liqueur. In some northern zones (Veneto or Trentino regions) people use to rinse out the emptied coffee cup with liqueur (traditionally Grappa) that they would then drink ("resentin"); this is also happening in Piemonte, where this custom is called "pussacaffè".